Since the beginning of the 21st century, the world has battled multiple epidemics, old and new, caused by viruses and bacteria.1 Some of these epidemics have reached pandemic proportions spreading exponentially across borders, for example the Zika virus outbreak in 2015-2016 in the region of the Americas demonstrated how a relatively obscure and mild mosquito-borne disease can become a global health emergency. The emergence and spread of drug-resistant pathogens has further increased the frequency and gravity of these epidemics, posing a major threat to the world’s population. Experts estimate that the number of deaths associated with antimicrobial drug resistance will increase to 10 million a year by 2050.2 A deeper understanding of disease pathogenesis as well as research into new and effective therapies could prevent such a scenario. In response, MMV and DNDi, in association with scientists from industry and academia, have assembled the Pandemic Response Box to foster new research into treatments for pandemic diseases. The box will provide the community with a set of 400 structurally diverse compounds for screening against infective and neglected diseases. 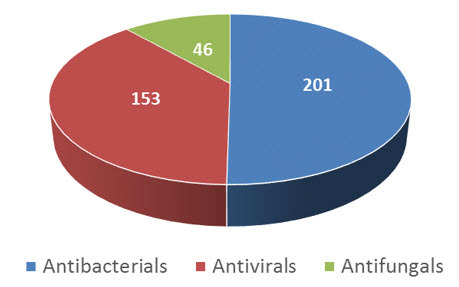 These 400 compounds with diverse mechanisms of action have been selected by disease experts from a comprehensive list of antibacterial, antivirals or antifungal compounds. All of them are either already marketed or are in various phases of drug discovery or development. The compounds biological activity has not been confirmed by MMV/DNDi partners, the selection has been made based on the information available in the literature. The Pandemic Response Box is composed of 201 antibacterials, 153 antivirals and 46 antifungals. See the full list of compounds .